Congratulations to the Swimming and Diving Eagles on capturing the 2019 WMPSSDL championship in dominating fashion on Saturday, February 2 at the Fairland Aquatic Center in Laurel, MD. 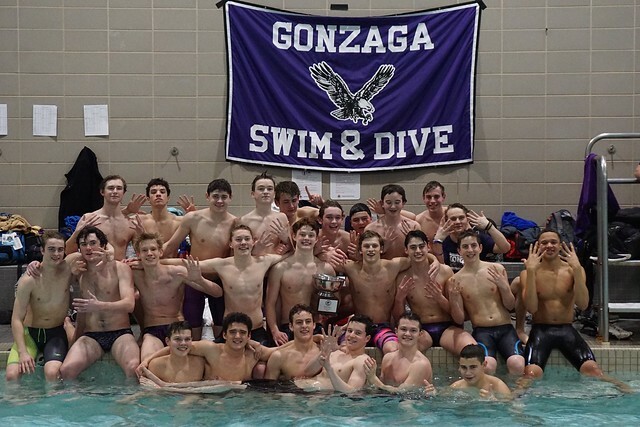 "Gonzaga won its ninth consecutive Washington Metropolitan Prep School Swim Dive League (WMPSSDL) title Saturday night in Laurel, finishing with 463 points to easily outdistance Georgetown Prep (336) and Good Counsel (211)," wrote the Washington Post. When talking about the pressure to repeat each year Head Coach Patrick Maloney told the Post, “It creates a culture where we want to make sure we’re as invested as they were the year before, if not more.” The Post also highlighted the incredible spirit the Eagle swimmers showed throughout the meet in support of their teammates. Click here to read the article.